Author: Cricket, Publishers of Ladybug and Set In . . . Description: A big laugh starts small. The tiniest giggle-speck tickles your tummy, expands in your funny bone, nearly explodes in your cheeks, and then . . . WE HAVE LAUGHTER LIFTOFF! Nobody knows big laughs for young readers like the Parents’ Choice Award–winning Spider magazine, a Cricket Magazine Group publication. 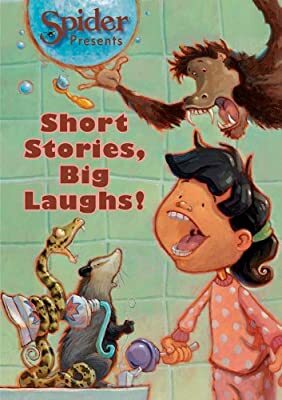 Short Stories, Big Laughs!, hosted by the hilarious Spider (he’s so cool they named the magazine after him), features 16 of Spider’s funniest original stories and poems, all in marvelous full-color illustration. Titles include: “How Winston Lost His Math Homework,” “Ribburta and the Rootintootin’ Highfalutin’ Ballet Extravaganza,” “The Sniz Ort,” “Dear Tooth Fairy,” and “Orange Schmorange.” Snorting is highly encouraged.